Cape Town’s Two Oceans Aquarium celebrates the unique collection of marine life that lives off South Africa's coasts, where the Atlantic and Indian oceans meet. Travelers can get a glimpse of life below the surface of the ocean surrounding southern Africa, including microscopic creatures, magnificent fish, penguins, turtles, sharks, stingrays, rare seahorses, and colorful clownfish. This kid-friendly attraction is an ideal destination for families, offering a number of opportunities to explore, experience, and engage with the underwater world. The popular attraction is part of the Cape Town City Pass, including 45 other popular attractions like the District Six Museum, Table Mountain Aerial Cableway, and the Wheel of Excellence, and it’s also a stop on the hop-on hop-off bus. Animal lovers can combine their visit to the aquarium with a stop at the World of Birds Wildlife Sanctuary and Monkey Park in Hout. 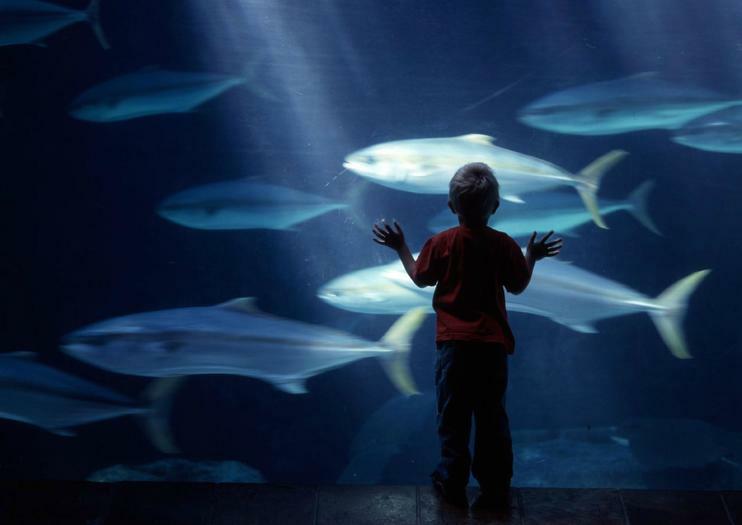 The aquarium is a must-see for families and animal lovers. Choose between a standard entrance ticket and a multi-attraction ticket that includes access to other Cape Town attractions. All exhibits are wheelchair accessible, and wheelchairs are available free of charge. The Two Oceans Aquarium is situated along the Victoria & Alfred Waterfront. The easiest way to reach the aquarium is by taking MyCiTi Bus 104 to the stop just outside the aquarium. The Two Oceans Aquarium is open 365 days a year and makes an ideal rainy day activity. To make the most of your time in the aquarium, plan your visit around the animal feeding times in the Penguin, Predator, and I&J Ocean Exhibits. In addition to inspiring environmental stewardship through its exhibits, Two Oceans Aquarium participates in conservation and research programs around the globe, including tagging and releasing of ragged-tooth sharks, freeing seals caught in fishing lines, rescuing beached sunfish, and rehabilitating injured sea turtles so they can be returned to the wild. Cape Town sits at the intersection of the Indian and Atlantic Oceans, making its surrounding waters a unique ecosystem teeming with marine life. Visit the Two Oceans Aquarium with skip-the-line access, where you can see some of the region’s most famous aquatic residents including sharks, yellowfin tuna, Knysna seahorses, the rare hagfish, and much more. Perfect for those short on time, this 30-minute sightseeing cruise focuses on Cape Town's highlights. See resident seals and visiting ships in the Alfred and Victoria basins, accompanied by informative commentary from an onboard guide.